Muskegon State Park is located on the north shore of Muskegon Lake, and much of the park is on a peninsula formed between Lake Michigan and Muskegon Lake. It has over two miles of shoreline on Lake Michigan and over a mile on Muskegon Lake. To get there from Grand Rapids, take I 96 west to exit 1, which is US 31, and go north towards Ludington. Take the North Muskegon Exit off from US 31, which is an exit on the left, and then stay to the right, as there are a couple of jogs to the right, and follow the signs to the park. It is easy to get to. The park has many different loops of hiking trails, that you can do as one loop, or switch from loop to loop to make a hike the length that you want. You’ll need a Recreational Passport to use the park, that you can purchase at the park, or any Secretary of State office. 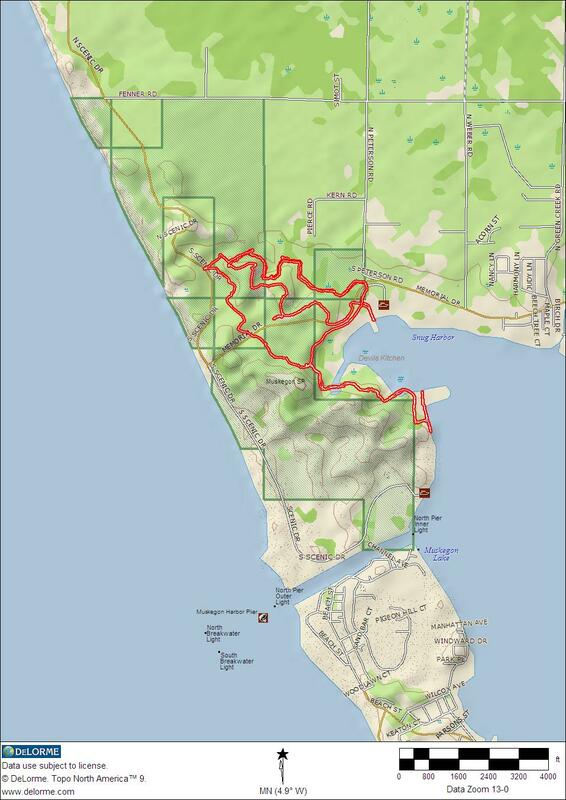 Here’s a link to the DNR’s website for the park, and one for a trail map of the park. I have a love/hate relationship with Muskegon State Park, and the area in general. Of course, the Lake Michigan beach there is beautiful, as beautiful as any beach in Michigan. I learned to swim there, way back when I was but a wee lad. The trails don’t really encompass the beach, but you are free to walk it anyway, if that’s what you want to do. The part I hate about Muskegon is that it is an industrial city, old and ugly, and many of the views of Muskegon Lake are also views of the industrial decay in downtown Muskegon, on the other side of the lake. The trails are worn and rutted, which doesn’t bother me, but they aren’t as spiffy as are many others. What I like about them is that there is almost always something interesting in view, Lake Michigan, Muskegon Lake, or Lost Lake, as far as water. There is also a lot of wildlife in the area, deer and turkeys on the ground, eagles and ospreys in the air and trees, and waterfowl on the lakes. Some sections of the trails take you along the low ground at the base of the dunes, other trails take you right up the spine of some of the dunes. There is also the site of the Bay Mills Indian Village that used to be on the shore of Muskegon Lake, of course there’s nothing left there, but it is still an interesting thing to note as you walk the trails there. You can always find a trail that suits the weather, if it is a windy cold day I stay on the low trails sheltered from the wind by the dunes, on a bright sunny day, I’ll walk the tops of the dunes. Almost the entire area is wooded, right up to the Muskegon Lake shoreline, and there is a wide range of species of trees and forests, from lowland pines so thick you can’t see very far, to the more open hardwood forests. I have only been there a few times so far, and haven’t come close to covering all the trails, and all the combinations that are possible there, yet this place has it all, except a river. Well, there is the Muskegon River channel that empties into Lake Michigan, but that doesn’t count. It would be a good place to kayak as well, Muskegon Lake is huge, and there are a number of streams that empty into it that you could paddle up a ways, a couple connect to smaller lakes, like Bear Lake. You could easily spend an entire day kayaking around Muskegon Lake and the wetlands on the eastern end, checking out all the waterfowl that make the lake their home. The only downside to this park and the trails is the heavy snowfall in the winter. Being right on Lake Michigan, the lake effect snows dump much more snow there than even a few miles farther inland. Not only can that make walking difficult, it can even be hard to get there when the snow is falling hard. I would imagine that it is also extremely crowded in the summer, I know the beach is, as are the campgrounds. Overall though, I rate it as my favorite “off-season” place to hike. Besides kayaking, which I have already mentioned, there is great fishing in Muskegon Lake as well. There is a winter sports complex located on the northern end of the park where you can rent cross-country skis, and they have lighted trails for cross-country skiing at night there, as well as a luge run, which is open to the public. On the south end of the park, along the channel, you can look across and see the USS Silversides docked in the channel. The Silversides is one of the few remaining WW II era submarines, and the park has one of the best views of the sub overall. As a life long muskegonite I find it interesting reading an outsiders perspective. This is an accurate description. Muskegon Lake on the east and south east side has populated by industry. Most of those sites are in demolition or are in the process of being shut down. Muskegon is a city with some of the best hiking and beaches, with a thriving old world feel downtown. That can rival any lakeshore, Muskegon is highly underestimated and is working hard to create a new reputation for itself. Thank you for taking the time to comment! I love Muskegon, but part of the reason that I do is because it has been over run with tourists yet. I would like to see the city perk up a little, but not at the expense of the natural surroundings.